These little tags are to put on the top of your computer monitor as reminders. 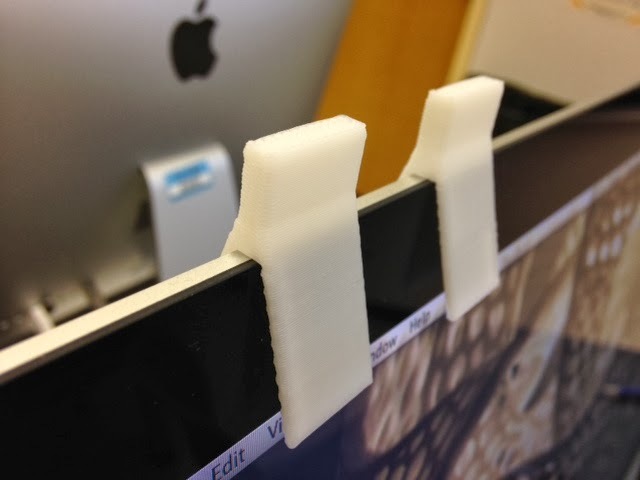 You can also lightly clip a small paper to your computer with these. I'll also use them in class as participation tags - when a student contributes in class they can remove their tag - but at home I'll be using them to remember to buy milk or go to an appointment in time. Settings: Afinia .3mm default fast in 13 minutes each, printed upside-down so that supports are not needed. Technical notes: These are designed for the new iMacs which have very thin edges but get thicker in the middle, which is why the tags have a "V" shape. Other monitors might require more right-angle-shaped tags. Stuff you might want to change: You could add a design or hole in the front face, or put a shape on the top, to indicate specific things you want to remember.